Alexandria Villasenor, barely a teenager but old enough to be profoundly scared for the future, has jump-started the climate struggle in the United States. For 14 weeks through frigid temperatures, the seventh grader nicknamed “Lexi” has walked out of class every Friday and demonstrated on a bench by the United Nations Secretariat building in New York City. As cofounder of Youth Climate Strike US, she has organised a mass walkout for Friday. The centerpiece is an 11-minute strike at 11am (16:00GMT) to emphasise that in 11 years the world risks exceeding the temperature limit cited by scientists, beyond which the effect of global warming will become catastrophic. “Every Friday [since August] folks have been protesting, mostly in Europe and Australia,” said Villasenor, 13, whose hooky-for-a-cause partners are Haven Coleman, 12, in Denver, and Isra Hirsi, 16, in Minneapolis. Demanding that the government declare a national emergency on climate change, on Friday the trio will join tens of thousands of students in about 100 countries. The US has already seen the viral successes of activist youth, mostly affiliated with the Sunrise Movement, who repeatedly stormed the halls of Congress, doing sit-ins outside the office of House Speaker Nancy Pelosi, standing down Senator Dianne Feinstein, and swarming Senate Majority Leader Mitch McConnell. But this will be the first time that US young people participate en masse in “Fridays for Future” protests begun by 16-year-old campaigner Greta Thunberg. The Swedish activist gained global attention by riding the rails to Davos, Switzerland, to lecture global economic barons, in addition to her speeches at the European Union and the COP24 climate summit. Villasenor moved from northern California to New York with her parents last year, so her mother could study climate science at Columbia University. When back on the West Coast over the Thanksgiving holiday in November to visit family in the city of Davis – downwind of the Paradise wildfire – she experienced an Air Quality Index of 350. She told Al Jazeera that breathing the worst air in the world was the pivotal moment for her climate activism. Who is to blame for California wildfires? “We won’t stop making noise until we get the necessary climate action,” said Villasenor, adding that “the Green New Deal is one of the only proposals to meet the necessary standard”. That resolution aims to wean the US off fossil fuels and launch a massive public works programme. 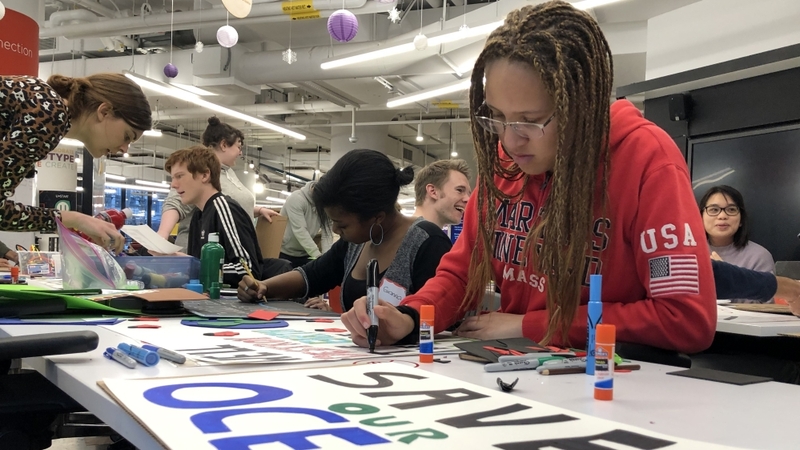 In preparation for Friday’s events, she and a few dozen other young students gathered at New York University’s engineering lab last weekend to make posters and strategise. Alex Serio, spokesperson at March for Science NYC, which organised the gathering, said that because the previous “pie-in-the-sky” goals of the climate change movement were not tethered to actual proposals on the table, the Green New Deal offers “a great shot at moving policy”. March for Science has been holding annual marches around Earth Day since 2017. The group, which includes university students and professionals, advocates increased government funding for science and full acceptance of the scientific consensus on climate change. Berfond is a volunteer with Sunrise Movement NYC, and says she is motivated to “change the conversation about how we better our society”. “This is a social and political issue of justice,” she says. Sunrise Movement is one of several groups bringing out young people to rallies and demonstrations. They may go by a variety of names and mobilise around slightly different themes, but their goals and tactics are overlapping. Climate SOS: How do countries cope with emerging disasters? Miles Goodrich is the New York State director for the Sunrise Movement, which has organised hubs at several colleges in the New York City area that will join Friday’s walkout. Goodrich said that the upsurge in youth activism following the Parkland school massacre in February 2018 had a significant effect on his group’s popularity. Many of the Sunrise founders had already cut their teeth in politics, he said, with the fossil-fuel divestment movement. The 25-year-old activist also said that the traditional left had failed to grab national attention around the climate issue. But Sunrise has been able to cast a wide net, attracting interest from union, healthcare, and immigrant rights groups. Under no illusion that the Republican-controlled Senate or Republican President Donald Trump will get behind the Green New Deal, the Sunrise Movement is laying the groundwork for the 2020 elections, which they hope will usher in new legislative and executive partners for transformative action. The group says its role is to convince voters and earn a mandate to tackle the problem. They reject austerity policies and the idea that anyone should have to choose between clean air and affordable healthcare. And Friday’s strike is a chance for Sunrise, which has recently developed organisational heft across the country, to test its strategy for expanding the youth climate fight. Crazy Rich Asians: The return of Sham-East Asia?